Unless you live under a rock, you’re likely aware that DraftStreet was recently bought out by DraftKings. Given that this time slot was previously designated for the discussion of daily strategy for Draftstreet contests, I’ve got to come up with some new material. But I’m going to milk the DraftStreet cow for all it’s worth and draw on it as a source of material for one more week. 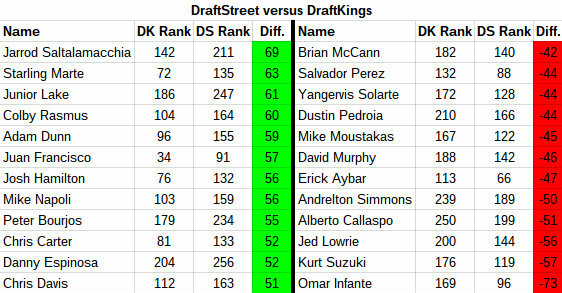 Because you can no longer play on Draftstreet, I want to take a look at how the scoring systems differ on the two sites you most likely transferred your money to, DraftKings and FanDuel. Today we’ll look at how the differing scoring systems affect hitters. These are the guys whose ranking among the 260 hitters with at least 200 PA changes the most when you compare their year-to-date production under the old DraftStreet scoring system to the scoring system FanDuel uses. It’s pretty obvious that (and this is going to be a theme here) guys who strikeout a lot are better options on FanDuel. FanDuel does not have a penalty for a strikeout whereas DraftsStreet would deduct three quarters of a point for a punch out. The fact that Juan Francisco ranks 32nd among hitters in FanDuel points for the year could not be more illustrative of how big the impact really is of no strikeout penalty. I don’t play much on FanDuel, so I can’t say for sure how well the pricing model acknowledges this, but I’m guessing a guy like Francisco is often a value play there. On the other end of the spectrum we have guys who aren’t penalized by something in the Fanduel scoring system but are no longer rewarded for not striking out. None of these guys strikeout more than 15% of the time. It’s also interesting to note that four middle infielders and three catchers show up on the bad side of the list. Again, I don’t know enough about the pricing models, but it wouldn’t surprise me if guys like Brian McCann and Salvador Perez are over-priced because of how shallow their position is. In other words, they may not be priced based on their performance compared to all other hitters and could be getting a little bump so that almost all options at catcher aren’t dirt cheap. Different picture, but pretty much the same story. Going back to Francisco for a moment, it’s worth noting that a high BABIP has driven his “success” so far. A couple other power hitters on this list, Chris Carter and Chris Davis, have not had as much luck with the BABIP. Both have BABIPs just south of .260, which is outside the .270-.310 range that is basically the accepted range of variance. If that turns around for them in the last couple of months, they could win you some money. Davis owns the third highest ISO against right-handed pitching over the last three years (.291), and his ISO at home is .303 over that same span. And since joining the Astros, Carter has the 9th best ISO against left-handed pitching (.251) and an ISO of .285 away from Minute Maid Park. Deploy accordingly. We hoped you liked reading Differences in Daily Scoring Systems — Hitters by Brett Talley!